So it’s the morning after my last performance with Welsh National Opera’s production of William Tell. Naturally I’m feeling a little worse for wear, so you’ll have to forgive my rambling writing… But it seems there has been a lot of discussion about Unions and Equity’s work for dancers in the recent fall-out from ROH discussions. It also seems there is a lot of speculation and misconceptions about the recent work in Equity and the fundamentals of what a Union actually is and how it works. So I’d like to clear up a few things, and bust a few myths..
Equity is not a service. Equity is by definition a unified group of workers. Therefore if the membership and involvement of dancers in the Union is bad, the work of the Union for dancers is bad. Because the members make all the decisions. Before we open the can of worms that is opera, I think its worth highlighting all the unsung work done by Equity and Unions that goes under the radar. Notably some high profile instances where poor conditions have been flagged up by workers and then resolved by Unions; the Kylie Minogue dancers ‘scandal’ in Australia was eventually resolved by Actors Equity in Australia, The CocaCola notice for unpaid dancers was taken down after an Equity statement and huge outrage online, the instance at ENO where dancers negotiated better performance fees mid contract was possible because they initiated the first Equity Deputy system for dancers on a freelance Opera contract. These are all Union successes and dancer successes. Because this is how a Union works. Equity is not just an office of union workers making decisions, its entire decision-making structure is made up of active Union members. A Union is a formal structure in which to unite workers within the same industry to work for improvements. It does provide many services included in membership -Accident cover, Public Liability Insurance, Tax and Welfare Help, Backstage insurance, contract advice, and more.. But its fundamental work is about workers organising to improve their working life. Going back to Opera.. perhaps I should be clear as to why Equity have had more success achieving improved performance fees while the weekly fee stays so low. It’s not broadly known that for a long time ENO de-recognised Equity contracts for dancers. They did this because they could. Because membership within dance was famously very low, and because they knew they could get away with it. Equity were able to re-established this, so they could at least be in a position to monitor and control the conditions and standards, and do everything they can to gradually increase rates. That’s how we ended up here, in a place where Equity have so little leverage to improve rates in the absence of a better representative group of opera dance workers. So this demonstrates very clearly that dancers’ membership and engagement with their union directly effects the power and leverage equity has. ie. no members, no power. In my personal experience, you were lucky to find 1-2 members in an Opera dance cast 3-4 years ago. Equity’s work for dancers in recent years has seen an increase of 79% in the new dance membership stats in 2014. Which is exactly why Equity now has more power to tackle the big issue of weekly fees in opera. To people working in the industry, the change is clearly happening. It’s palpable and its measurable. That’s why membership levels are on the up. This perception of it being us and them; dancers and Equity, is just wrong and misinformed. Equity can, by its definition, only work for its members. So I don’t know why people think that starting an entirely new Union with no experience and starting from scratch would achieve anything other than to divide the industry and make us even less unified and more powerless. It is still hard to find active dance Equity members who will engage with the structure to organise for improvements, but in the few months I’ve been in the position of dance representative I’ve developed a structure that has engaged over 200 dancers who want to work together to instigate change in our industry. We are developing clearer structures for safe, valued employment of dancers, finding ways to support new and small-scale choreographers in their employment practise, addressing the lack of career progression in dance, and doing broad company visits and school workshops to engage and educate workers. This is making actual change to the industry. It is overhauling dancers’ representation within Equity, and it is empowering Equity to work for dancers in ways they have never been able to before. And this is just 4 months in. It’s perfectly clear that Opera rates are still ridiculous and medieval, but uninformed criticisms that quote false and inaccurate facts are actually just damaging our chances of changing this. They weaken our chances of being a unionised community, when we should clearly be sticking together to achieve the obvious common goal. When you criticise equity’s powerlessness, you’re criticising the efforts of dancers who are actually trying to DO something to effect change. People who are not just talking about making change. If you want the change in the industry you claim you do, then surely you should support these people, not make uninformed critiques. Please people, have some perspective. When Equity does finally get a response from ROH to their current claim, Equity will be pushing every option they have to ensure ROH fulfil their responsibility of paying dancers a decent professional wage, and I hope we can all work TOGETHER to ensure this happens. We want the same things, so let’s stick together ey? 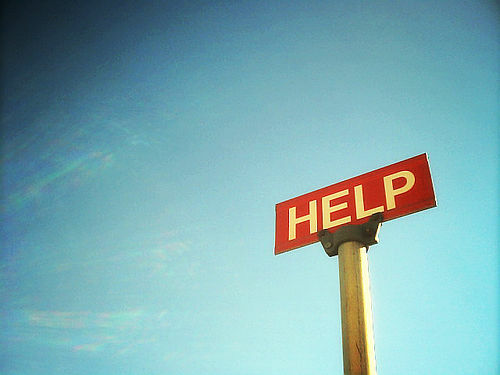 New Campaign- I need your help!! I am currently in the beginning stages of developing an Equity campaign to overhaul the standards within the Freelance/Arts sector Dance Community, and I have just been revisiting this article I wrote last year.. I am wondering if things have changed since then.. have standards improved? declined? or do they remain unpredictable?? One aspect that I am exploring is the obligation of Arts Council England and subsidised companies to ensure workers are paid a legal and Union equivalent rate. Which means that ACE funded companies HAVE to pay you an Equity minimum rate of £420 per week, or equivalent daily rates, in the terms of their grant. I know this does not always happen. As I’m formulating objectives and an action plan, it would be great to hear opinions from professionals and stories of poor working conditions..
And please share this with your colleagues and other professionals. It will really help my research and it is so important for us as professionals to know what is going on, and what is unacceptable. Yes there are only 7 days left to vote in the Equity elections. 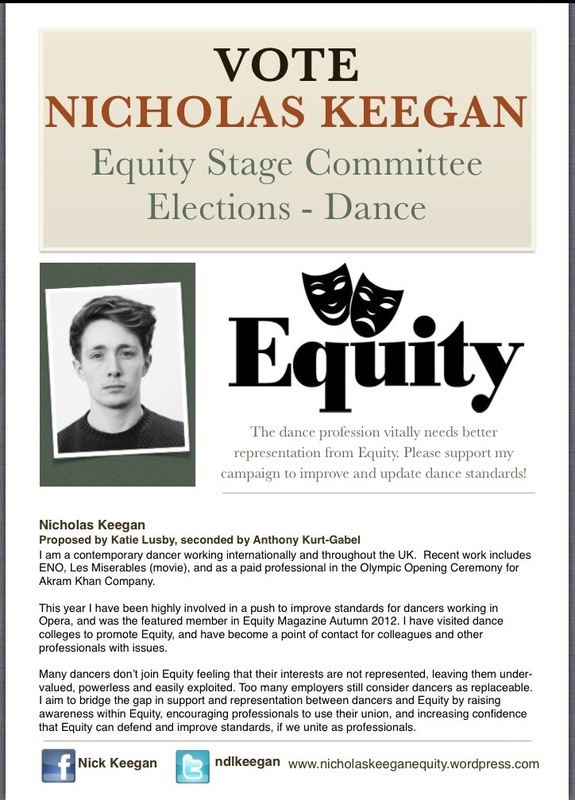 This is a last minute appeal to all Equity members to use your vote, and for dancers to get involved in your union! Ballot papers were sent out about a month ago, so have a rummage and please give me a chance to really make a difference and give dancers’ representation a much needed overhaul! You can also vote online below, and if you have already voted thank you so much for your support. This is a call for artists… to come together, and represent yourself and each other. Are you a Dancer working in the Modern/Contemporary Arts sector/cross genre? Are you a member of Equity? Are you a member of Dance UK? Are you a member of both? Does Dance UK have enough power/influence to improve the rates and standards of your contracts? Does Equity actually know what it is you do for a living? Why is there no infrastructure representing and defending the rates and standards of dancers working in the Modern/Contemporary Arts Sector? Why are we, the workers of this huge community and profession, not demanding infrastructure, representation, and financial value for the work we do? Equity needs to recognise and provide relevant support to this under-represented genre. Modern/Contemporary Dancers need to join their union to demand support and change. Irrespective of the outcome of the stage committee election, I still intend to set up a campaign to unite Dance companies/agencies/organisations in their support of improving and addressing the issue of rates and standards in dance. To create a consistent and comprehensive structure that protects and defends the rights of all performers working in the Contemporary/Modern Arts sector. Here are a some interesting perspectives on pay/employment issues, and one which is more of an appeal for togetherness, which felt appropriate to share. So I am writing here to persuade you to vote and support me in the upcoming Equity Stage Committee election. But I am also trying to aim high, with the belief that we as professionals can control and have positive impact on our industry. I have no desire to talk about the difficult “financial climate” for the arts with a defeatist attitude, because I believe in the real, human value of art and culture on our well-being and quality of life, and I think the people of this country do as well. The recent attention on the contribution of arts and culture to national economy is positive and valuable to the defence of its subsidy. Largely because it means we don’t have to rely on persuading people about “non-monetary benefits”. The fact of the situation is that every industry is having to make their “economic argument”, and if we hope to continue and develop in this environment then we need to defend the people who are creating and performing. They are our product, our assets after all. The working standards of individuals can seem small or insignificant in the big picture of Art/Culture/Economy, but I believe defending artists is vital to developing the value and quality of the whole profession. Other countries already recognise these benefits by having systems that subsidise not just the work, but the professional, artistic development of the individuals. The influence and power to initiate action on these issues lies entirely with us. A trade union is its members, and only has power when it’s members are active and vigilant. This includes putting aside any sense of artistic superiority. I think contemporary dance/arts sector performance art (whatever you want to call what it is you do) is sometimes guilty of this because some strive to have distance from commerciality. So perhaps the idea of being classified within the larger community of performing arts is unappealing. But if we don’t do our part, it is only us who will suffer. If we recognise and fight for the value of individuals, then we are simultaneously fighting for the value of our profession. It does not always come from high profile conflict, but from the consistent, intelligent, vigilance of individuals. A trade union that works creatively and intelligently is formidable. The campaigning and voting starts in June, but in the mean time please take a look at previous posts/articles I’ve written, and above all please share and discuss these issues with your colleagues. Please get involved. Please join your Union.